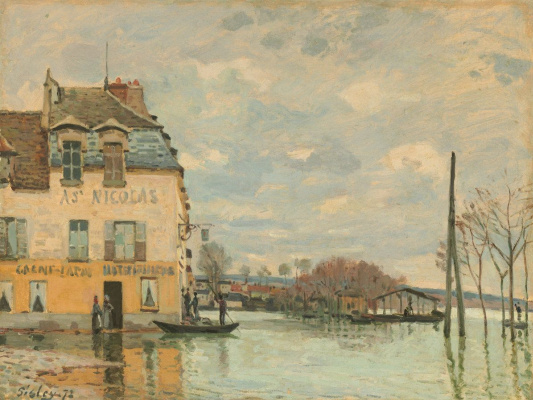 In 1857, his parents sent Alfred to London for training of Commerce, but he preferred to paint, and in 1862 returned to Perigee impact on Sisley as the artist has had a British master William Turner, John constable and Richard Parkes Bonington, as well as the French Camille Corot, Gustave Courbet and Eugene Badenv 1866 Sisley married Marie Eugenie Lekotek — from this marriage had two detestableness work Sisley has not survived. 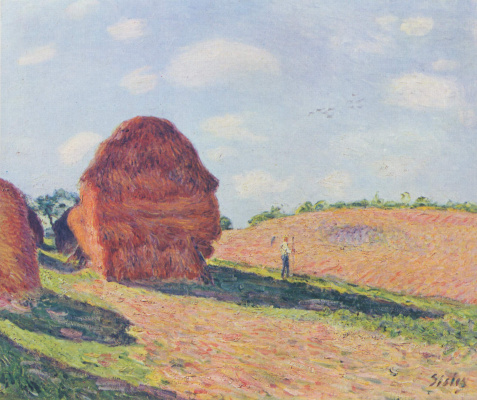 Early work is characterized by a harmonious and air landscapes, brings the artist with other Impressionists. From the mid-1880s, in a manner Sisley began to increase elements of decorativeness. Born in Paris and eighteen sent to England to study Commerce, Alfred instead became interested spectacular revelations constable and the Bonnington and one of the first "discovered" for the French landscape innovation Turner. On his return to Paris Sisley he entered the Studio of the artist of Gleyre, where he became friends with Claude Monet, Auguste Renoir and Frederick Basilio. Quickly disillusioned in academics, throw all four classes of Glare. Intending to find beauty in the ordinary, young innovators settled in Chailly near Fontainebleau. Since forever undecided motives Sisley — the image of the capital he prefers her humble surroundings inconspicuous corners of the provincial cities. 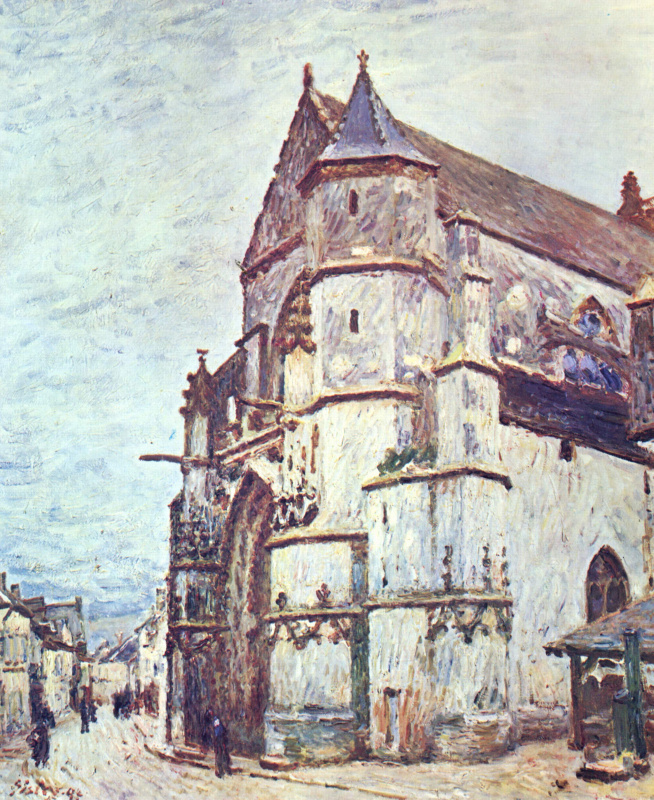 In 1866, Sisley works in Marlette with Renoir, in 1867 — in Honfleur with Basilio. Then followed the beloved Impressionists Argenteuil and finally the Port Marley, especially loved Sisley. Only one theme floods in Port Marley was it a series. 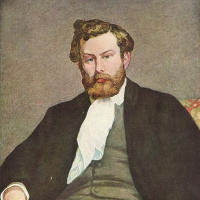 During the Franco-Prussian war Sisley as a British citizen was in London, where he struck up a very useful acquaintance with Durand-Ruel, who soon became a patron of all the Impressionists, the organizer their exhibitions in its galleries in France and abroad. For the first time in art criticism name Sisley mentioned near the comrades in memorable for all 1874. 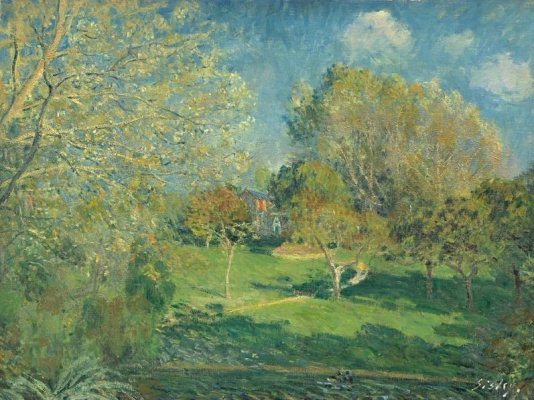 As all the Impressionists, Sisley in the painting is not the plot, but the finest features of the natural conditions of light and color. Insatiable in the attainment of skills, the artist was not ashamed to learn from peers. So, together with Camille Pissarro he wrote winter landscapes in Louveciennes for the study of public Impressionists reflexes and coloured shadows, at another time painting Sisley was under the influence of Renoir and Monet. Not in vain the artist felt a strong attraction to music, a love which was taught to him by his mother, and then developed the joint performances with Frederic Basilio. 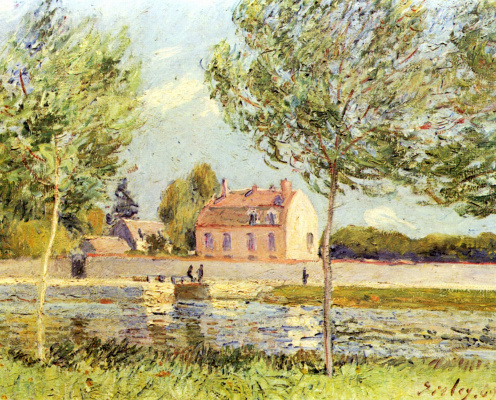 Sisley wrote that musical phrase is like a part of himself — musical painted all his paintings. Because of this he often deliberately brings all the colouring of the picture to one of the tonal key — blue, as in "Flood in Port Marley", or gray, as in the "Windy day in Vienna". Art. 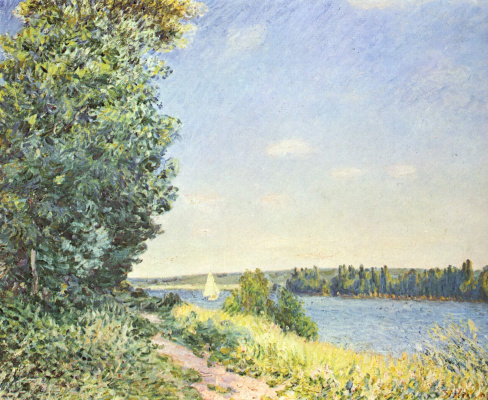 to the beginning 80-ies, the manner Sisley, unlike Pissarro or Monet, later they changed little. Reserved and shy, focused exclusively on the work, the artist felt little interest in the broadcast declarations and even less to the "shocking" did not understand impressionism bourgeois public. In a raging controversy professionals, nightly incipient in a Paris cafe, Sisley was the last. Nevertheless, it was his silent, but always reliable, chose usually Commission for exhibitions and for making important for the whole group decisions. 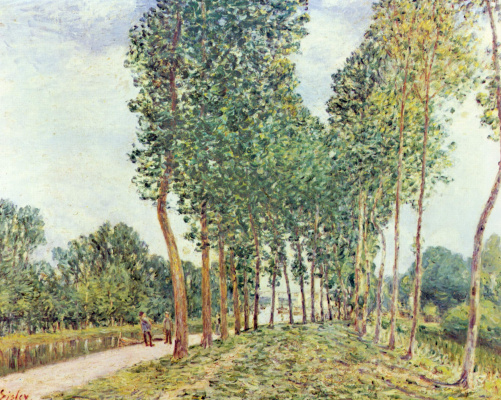 After the Boulevard des Capucines Sisley participated in the impressionist exhibitions 1876 and 1877 years, but then walked away from the exhibitions. Completely surrendering one of painting, communicating only with the family, he leads impoverished existence, receiving a paltry sum for his paintings and sinking deeper in debt. But most importantly, increases his loneliness and alienation from colleagues. Since 1882 Sisley generally leaves the traditional meeting of the Impressionists. Joyful light remains only in his landscapes. And in 90th years the artist has not achieved the level of success, which by that time has found Pissarro, Renoir and Monet. 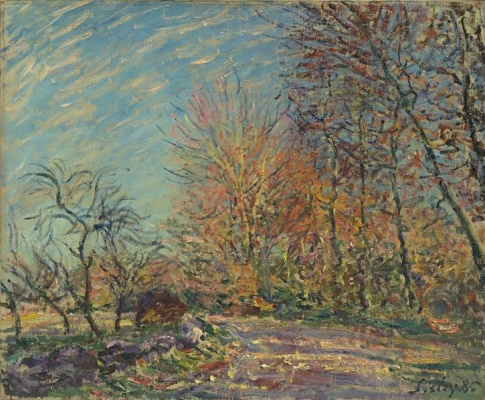 In 1897 Sisley makes a last-ditch attempt to escape from oblivion by means of a personal exhibition. That criticism and replied with a friendly silence, became for the artist, the final blow. Only then he thought of the friends of youth and caused one of them to lie. 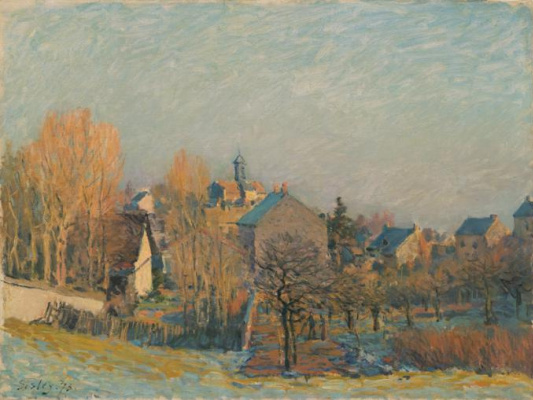 Six days after arrival of Claude Monet — January 29, 1899 Alfred Sisley died in the town of Moret.